Giving you guys a break from the sweet overload on my blog these days. But this break is temporary and there are a lot of Valentine’s Day recipes to be shared in the coming weeks so stay tuned for that. 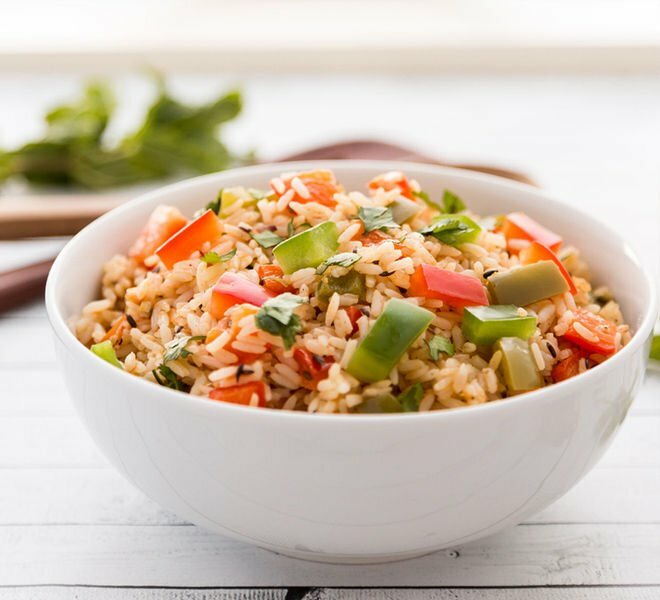 For now lets talk about this spicy bell pepper rice or as we would call in India, capsicum rice. I never get this, why same thing has different names in different countries. It makes everything complicated! If I say bell peppers in India, my mom is never going to understand which vegetable I am talking about and if I say capsicum here, people will assume I am talking about something else! Anyway this rice dish with green and red bell peppers comes together in minutes and is quite flavorsome. Everyone who knows me, knows that I love bell peppers. In fact some people find it very weird when I tell them that bell pepper is my favorite vegetable. People have this look like “what are you even talking about”?! I don’t think it’s a very common response! 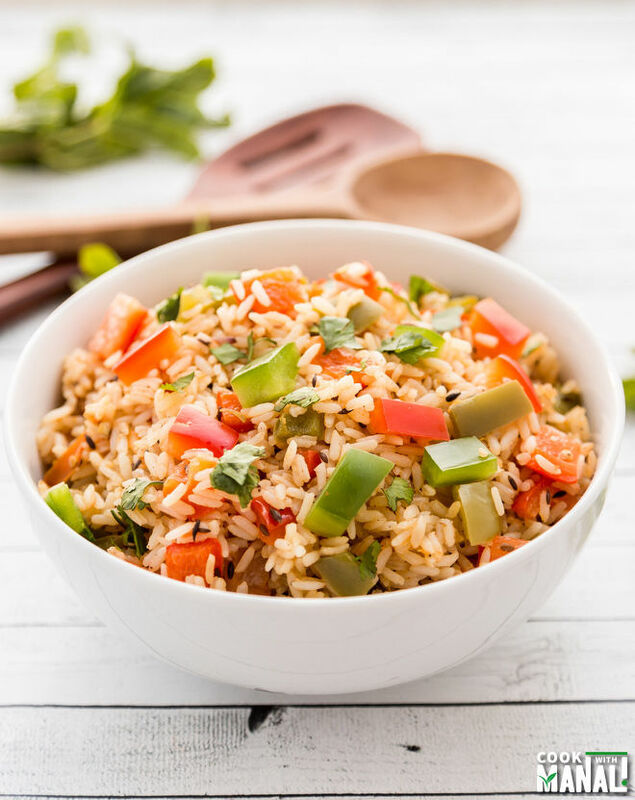 To make this capsicum rice all you need is some cooked rice, onion, tomato and of course capsicum/bell peppers. I used a mix of green and red bell peppers but you can use only green or a mix of other bell peppers too. This is an easy one pot meal which you can prepare without much stress for weekday dinners. I have used long grain rice here, basmati would work just as well, in fact better here! Heat oil in a pan on medium heat. Once hot, add green cardamom pods, black cardamom, cinnamon stick, bay leaf, cloves and peppercorn. Saute for 30 seconds till you get a nice aroma of the spices. Add the cumin seeds and let it splutter. Also add the chopped green chili and saute till it starts turning light golden in color. Add the chopped onions and cook till they are translucent and the raw smell goes away. Now add the ginger-garlic paste and cook till raw smell goes away, around 2 minutes. Cook the tomatoes for 5-6 minutes or till they are soft and nicely cooked and there’s no raw tomato smell. Add the chopped green and red bell pepper and cook for 1-2 minutes. 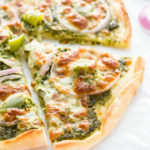 Cook the veggie mixture till yogurt is well combined with the veggies and spices, around 3-4 minutes on medium flame. Also add the salt. Add the cooked rice into the pan and mix thoroughly. After 2 minutes, sprinkle garam masala on top and mix. Cook for another 2 minutes on medium heat. Squeeze in lemon juice [if using]. Place the rice in serving bowl, garnish with coriander leaves and serve. 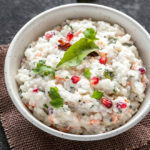 Serve the capsicum rice hot with raita [yogurt side dish]. * Adjust spice level to taste. Add more green chili to make the rice spicier. * To make this vegan, simply skip the yogurt and follow the rest of the steps as it is. 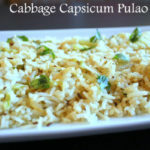 Capsicum Rice - One pot flavorful rice cooked with spices and lots of Capsicum/Bell Peppers. Once hot, add green cardamom pods, black cardamom, cinnamon stick, bay leaf, cloves and peppercorn. Saute for 30 seconds till you get a nice aroma of the spices. Add in the chopped tomatoes and cook the tomatoes for 5-6 minutes or till they are soft and nicely done. Cook the veggie mixture till yogurt is well combined with the veggies and spices, around 3-4 minutes on medium flame. Also add the salt and mix. After 2 minutes, sprinkle garam masala on top and mix. Cook for another 2 minutes on medium heat. Squeeze in lemon juice [if using]. 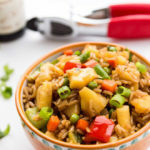 I haven’t had rice for a while so this recipe seems just perfect for this weekend. Omomomomomo!! 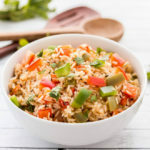 Delicious rice recipe, Manali! I can totally taste how yummy these are! pinning! Thanks for the pin Savita! Fried rice is one of my go to staple dinners. I love this spicy bell pepper version manali – you always have the most delicious spins on traditional dishes!